Do You Want A Magical Christmas? I’m sure you’ve heard this before, but don’t wait for the last minute to do your shopping. It’s a jungle out there. Besides shopping for others, are you prepared to entertain all the people you are going to see over the holidays? If you are looking for gifts for kids we have 2 Magic Kits in stock, the Most Unbelievable Show by Fantasma, which I would recommend for ages 6 and over if its their first kit. The other kit is Telepathic Power, which is recommended for 8 and over. Many adults have bought it for themselves and love it. 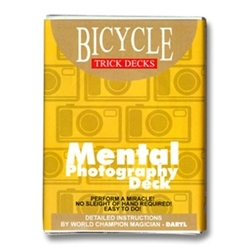 It has a great DVD and 20 tricks. It’s well worth the price. Another Kit we carry is by Joshua Jay. The Complete Magician. It includes his book with his DVD, a set of linking rings, a thumb tip, 2 trick decks and Pen thru Bill. That would be great for teenagers or adults. And if you don’t want a kit or set, we would be happy to guide you through individual tricks age appropriate and within your budget. And don’t forget to tell you family and friends that we have Gift Cards. I would save them from breaking their heads as to what to get you and don’t forget we’re having a Promotion on them now. Just don’t wait until the last minute. In addition to our normal hours will be open on Saturdays December 6, 13, and 20th from 11:am to 4:00pm. After that we’re on vacation. The magic audience never changes. I should say the reaction of the magic audience never changes. That’s why, night after night, professional magicians do the same shows, use the same words, make the same pauses, the same expressions. It’s almost robotic. Even if the performer seems to be casual, making an off the cuff joke, there is nothing causal about it. Its his professionalism that makes it seem casual, but its not. The pros have it down to a science, to the minute, to the second. Timing IS everything. Why don’t they change their shows? They did at the beginning, when they were starting out and tried something that didn’t work, until they found something that did work and they kept it in. They know if it works for one audience it will work for all audiences. The show evolves and when the performer gets the laughs and the applause that he or she wants, that’s their show! That’s how I sell that wonderful classic card trick, the Svengali Decks. All these kids that watch youtube and want this and that, I just take out a Svengali Deck and ask them if they have any trick decks. No? Oh, let me show you this. My presentation is the same every time. My grand daughter, age 6, was here after school the other day. While she was here I showed it to a kid, in just that situation, who had seen all these wonderful things on youtube, and when I did the demo for the Svengali, he was as excited with it as could be and bought it without a second thought. Ten minutes later another kid came in. My grand daughter said, “Bubby, show him the trick you showed the other kid.” She knew. I did. This kid bought it too. It makes no difference if its a child or an adult. Same reaction. As I said, the audience doesn’t change. Who comes to see a magic show? People who are fascinated by magic. They want to enjoy the show. They want to like you and they want you to mystify and entertain them. The pros learn what works, even if the people go to youtube to find out how, when you do it properly in real life, they still can’t believe it. Why do I say the audience never changes? Because people are people. Everywhere, any language, any colour, it doesn’t matter. Ever play peek-a-boo with a baby? You’ll aways get a laugh. And it doesn’t matter how many times you do it. It’s their first intro to magic. Now you see it, now you don’t! When Romaine, The Monarch of Manipulation did his first manipulation show it was meant to be serious. His table fell over. Everyone laughed. He kept it in the show. He built his show around all the mistakes he had that night and there were many, only the audience didn’t know that, and they thought it was hilarious. He still gets the laughs! The audience goes away not only mystified, but happy as well. Now that’s not good for the magic business. Once they get into the groove, they stop buying magic. They have what they need, which is why I love to see the youngsters come in. They are still finding themselves. Trying out different things. Its a stage (no pun intended) that every magician goes through. They want everything at first, until they find out what gets a reaction and what they are comfortable with. Thank heavens for that discovery stage! “One of the reasons professionals always do the same thing is that they are hopefully performing for a different audience and like to go with the material that they know works and that they have spent years in perfecting. That is so true. With amateurs either they have to get new friends or get new tricks. Its easier to get new tricks. And it doesn’t hurt your magic dealer either. If you plan it right, have the right magic for you, (and your audience of course) the right assistant, the right lights, the right music, the right sound, the right script, etc. and everything goes according to plan, its easy to look professional, to be professional. But what happens if something goes wrong? I mentioned in an earlier post that Phil performed at a clown convention many years ago. He was the only magician in a show full of clown acts, some which were hilarious. Phil closed his act with the Multiplying Bottles. He did well up to that point, when he lifted a tube and saw his glass was missing. My heart sank, but he leaned into the mic and said in a sort of secret way,”Somebody stole my glass! This was followed by something like ” we’ll pretend its there or invisible” and went on with the routine. He got an tremendous applause. No one cared about the glass. 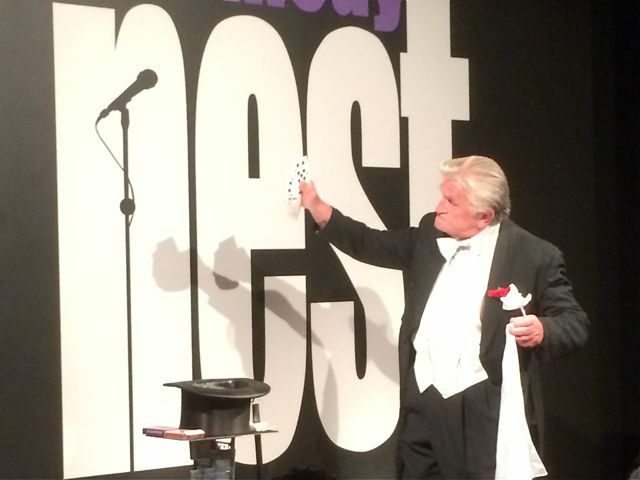 Last week we were at a magic show, which was great, and then something went wrong, but I guarantee that 95% of the audience didn’t know that. In retrospect, when discussing it after the show, I remembered there was a part that looked like a levitation was going to be performed and it didn’t happen so I guessed I was wrong. I never for one minute thought there was a problem on stage. Years later when the performer sits around with his cronies like Phil and I did after Father Cyprian’s 50th Anniversary, no one talked about all the wonderful things they did on stage. We all talked about all the things that went wrong and we had such a good time, laughing at ourselves and with others. That’s the beauty of live shows. You have to go with the flow, go where it takes you. It’s not the end of the world. I wrote this blog last week, right after writing last week’s blog. Why? Just as I was finishing up a man and his son came in. The man used to come to Magie Montreal, the Annual magician’s convention we ran for 19 years, in his younger days. The boy was about 11 and his school was having a talent show and he was into magic. He had been watching youtube and had also seen magicians perform on a cruise. He practiced all the time from what he learned on youtube. Now he wanted props and wanted to know what I would suggest. It was such a coincidence. He father thought everything I suggested was great but he wanted card tricks even though it would be a huge audience. He said there would be a big screen overhead. And this is the part that made my day. He answered, “Oh no, you’re not old, you’re cool.” I’ll be 74 next week. Coming from an 11 year old… that had a magical effect, indeed. I can live on that for awhile. P.S. The person I wrote about last week came back and said that that he realized that young children find card tricks boring. I held back from saying, “I told you so!” They do come around.